The Euro-Zone Gross Domestic Product will be released today, at 10 am a.m. GMT, so let’s take a closer look at the European Index. In fact, there are two indices. There is the “EURO STOXX 50”, which only includes companies from the Eurozone, i.e. excluding the UK and Switzerland etcetera, and the “STOXX Europe 50”, which includes companies from Europe, i.e. including Switzerland and UK. In today’s analysis, we take a look at the EURO STOXX 50. The bearish movement of the index began in May 2018 and continued until the end of December 2018. On December 27, 2018, the market reached a low of 2894. However, already at the beginning of the year, the market managed to push itself out of this low point. 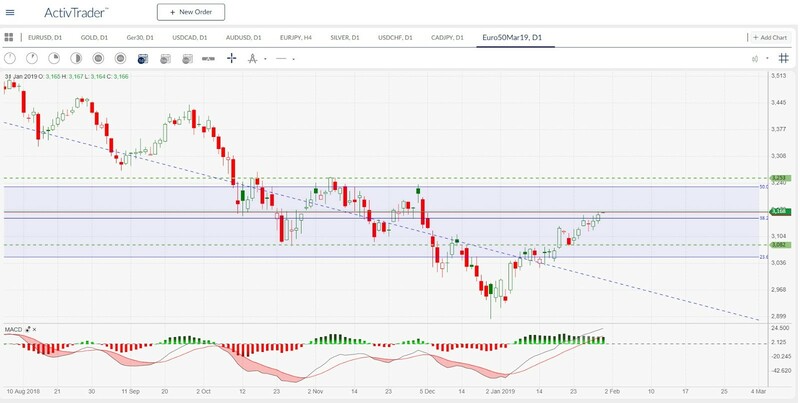 Currently, the market has found resistance for four days to the 38.2% Fibonacci retracement of the previous downward movement. Can the market break through this mark? The MACD is in positive territory, and the trend is still intact. So, if the market manages to cut through the hurdle of this resistance, the next resistance will be in the range of 3231 to 3253. At that point, there is a cluster of the 50% Fibonacci Retracement from the return of the downward movement and a significant structural level. If the market pushes down and the bears take over again, then the next support could be in the 23.6% retracement range at the latest. In this range from 3082 to 3052 the Fibo retracement and an essential structural level also fall together. If one of these levels is reached, we will need a new evaluation.